His idea of a perfect winter retreat is exploring the great outdoors, staking a claim to our National Parks, and getting a work out. Her’s is all for fresh air too, but not if it means a departure from civilization and important luxuries like Jacuzzis and maid service. Toss in some candlelit dining, copious shops ripe for browsing and a spa and now the lady is a traveling scout. To bring smiles to the little faces of the touring family, and prevent whining, amusements should be handy. Give them sledding, skating, skiing, and kid-friendly spaces. Where do you go to find this lengthy list of demands, while keeping a lid on your travel budget? An easy drive north is New Hampshire’s Mount Washington Valley. This scenic valley has been a haven for visitors since the early 1800’s. Today, the spectacular 780,000 acres of National Forest holds five ski resorts, some of the finest cross country terrain, and even ice climbing. North Conway lodging options range from quaint country inns, to chain hotels, condos and motels along Route 16. The mainstay town of North Conway offers a strand of tax-free outlet shops, scads of lodging options, and more restaurants, pubs and cafes than your belt will accommodate. This once quaint, now booming village does suffer from Route 16 traffic crawl amid the shopping sprawl. We skied Attitash Bear Peak, for its 77 trails backed up by an impressive snowmaking system and two high speed quad lifts. With 4 ski areas close by, we could have chosen the incredibly scenic and challenging Wildcat just minutes due north. Cranmore, located virtually in downtown North Conway, has an affordable everyday lift tickets and night skiing plus a wide variety of new and exciting toys like the Mountain Coaster. Black Moutnain is another good family choice is unadorned Black Mountain, with blast from the past facilities and pricing. King Pine is the region’s fifth area located just 10 miles south of North Conway. King Pine is a homespun family day area. Our vertically addicted family took a break from the slopes. The off-piste temptations proved more than we could resist the following day. I browsed some of my favorite outlet shops, Ralph Lauren, Dansk, Liz Clairborne, calculating the tax savings as justification for my spending. Even my husband indulged a shopping mood when he spotted Nautica and L.L. Bean. A brief tour of Mt. Washington Observatory’s Weather Discovery Center in North Conway is fun for the kids, and meteorologically educational too. Across the street, the Chocolate Factory is a treat to watch candies being made, then watch them disappear. Shopping North Conway can wipe you out, not entirely unlike skiing. We were glad to return to our quaint cottage. The kids headed for playtime in what for them were waist deep piles of snow. Cross country skiers and snowshoers passed by on our Inn’s trail system, pausing to check out our kids’ humble snow fort. Flipping the switch to the gas fireplace while I fetched drinks to sip by our fire, gas fireplaces make a hero boy scout out of any husband and urban dweller. This family ski vacation achieved what we always look for, something for everyone. We skied, shopped, skated, went sledding, and toured covered bridges. Along our adventures we breathed the requisite fresh air, we learned a bit, relaxed a lot, and found our smiles. 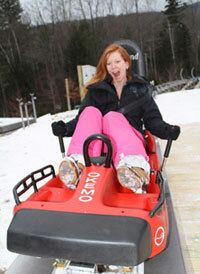 Next visit, we hope to tour on snowmobiles, cross-country skis, and try the mountain coasters at Attitash and Cranmore. I have ruled out ice climbing for my family. In our short stay, we discovered the winter sports playground of the White Mountain National Forest overflowing with fun for a family ski trip. Just over two hours north of Boston, we will be back to the Mount Washington Valley.